Every household has mending. It may be as simple as a button off a shirt or a hem on trousers or it could be a more complicated seam or zipper repair. 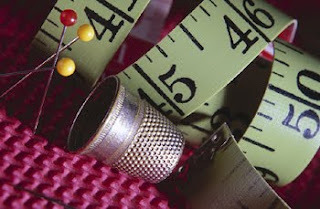 Whatever it is that needs fixing the garment usually finds its way to the mending pile. That pile can quickly get out of control simply because the mending is never done. If you're not going to sew the button on or fix the zipper immediately, put the garment in the rag bag straight away, otherwise it's just taking up space in your cupboard. But if you want a simple system to keep on top of the mending, have a basic sewing kit in the laundry and every week while the first load is washing, do the mending. If it's a complicated repair (like the zipper) make a time to sit down and do it. Some weeks you'll have a few things to mend, other weeks there will be nothing. Either way your mending basket will nearly always be empty and the mending under control.